The Atlantic has its Ganvié, so much envied. Overhead view of Gavnie. Click for source. Ganvié is a water town situated on the northern edge of the Lake Nokoué in southern Benin. Marketed as the ‘Venice of Africa’, Ganvié is probably the most well-known and foremost among other lacustrine villages in the same region. Ganvié is a favourite among tourists to Benin with the government policy aimed at transforming the town into a major tourist attraction. As Ganvié is considered a rarity on the African continent, due to the fact that the town was built on a lake, information on socio-economic activities, the physical environment and the modern-day ecological effects of human settlements on the surrounding Lake Nokoué is readily available. Incidentally, I learnt of Ganvié from a magazine article on the impact of climate change on the region. Less information is readily available on Ganvié’s fascinating history; Ganvié was founded by people in an effort to escape captivity and enslavement in the Americas. According to Elisée Soumonni, “little attention is paid to the ways in which local African populations resisted enslavement, giving the impression that any form of resistance began on board slave ships or in the Americas.” I believe this also fuels erroneous suggestions that all African ethnic groups were comfortable with slavery and enslavement, not knowing what they were heading to in the Americas and only revolting after their enslavement. The existence of Ganvié stands as a testament to resistance to the transatlantic slave trade within African shores. The people of Ganvié are today known as the Tofinu. 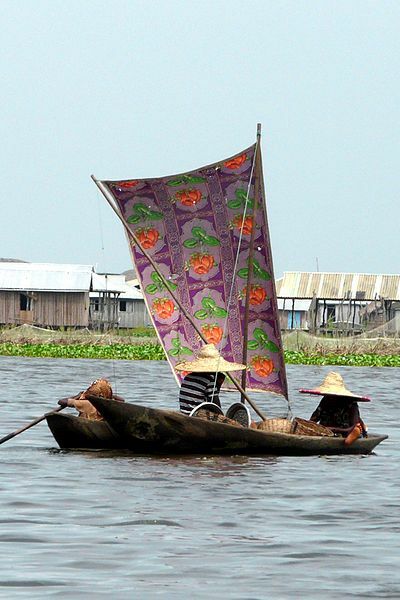 Today they are recognised as a unique and homogenous ethnic group; however, historically several groups of people across ethnic lines moved to the areas and marshlands around Lake Nokoué as refugees. They fled to escape slave raiding armies from the kingdom of Dahomey. Nowadays Dahomey is recognised as a powerful West African kingdom and is well-known among those who are interested in African history. Admiration is usually held for the kingdom, especially for the women that served in the Dahomean army, commonly referred to as ‘Dahomey Amazons’. It seems that the effects of the transatlantic slave trade to the kingdom of Dahomey is largely unnoticed for the most part; Dahomey was an important supplier of captives for enslavement in the Americas. It has been suggested that the Aja-speaking peoples, the people from which both the Tofinu and Dahomeans descended from, were among the largest captives in the transatlantic slave trade. Modern fishing boat of the Tofinu. Image courtesy of Wikipedia. The arrival of Tofinu refugees in and around the area of the Lake Nokoué began around the end of the 17th century and continued for nearly 200 years, as the Dahomey raided and supplied slaves till the 19th century. As the Dahomean kingdom grew–in 1724 the Dahomey conquered Allada and after that Ouidah in 1727–more people sought refuge and relocated their villages to swamplands. The expansion of the kingdom of Dahomey caused violence and slave raids to be associated with towns and cities under Dahomey rule. Thus as the Dahomean army conquered more land, refugees would move to ensure their safety and security. These refugees employed nature and their environment in their forms of resistance, Lake Nokoué and the swamplands surrounding it provided the perfect place for these people to relocate to. This natural environment helped form a obstacle against approaching Dahomey armies who were unfamiliar with naval warfare. Apparently the Dahomey warriors believed it was taboo for battles to be fought in or on water. The refugees first chose to settle on marshlands but had to move deeper into the Lake Nokoué due to the disposition of the wetland to dry up and exposing them to the perpetual threat of danger. The two towns that were abandoned by the Tofinu for security reasons became graveyards for the new towns of Ganvié and So-Tchanhoué. The founders of Ganvié were two rival Aja speaking groups from Tado, the Dakoménu and the Sokoménu. These two groups left Tado, first for Allada, and then for Sindomè, an island located in the delta. There the Dakoménu and the Sokoménu were granted protection by the chief under which they learnt to coexist and work together despite earlier misunderstandings. These two groups contributed to the growth of Sindomè but this brought them under the scrutiny of the Dahomey. An attempt to attack Sindomè was made when a canoe manned by soldiers was sent to raid the island but the refugees were able to make use of the Dahomey soldiers’ inexperience and overturned their canoe. It was after this incident that the people relocated to Lake Nokoué’s waters building their homes on stilts. 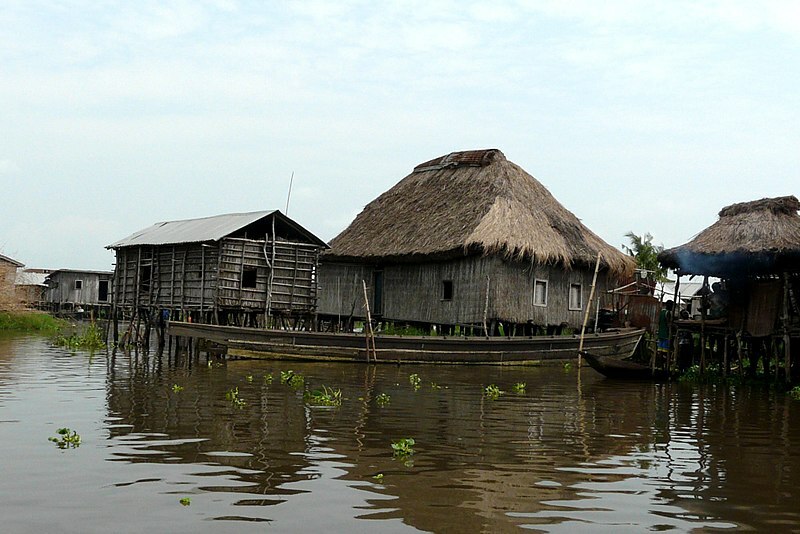 Homes on stilts were built along the edges of the Lake Nokoué and even deeper in the lake’s waters. These homes were constructed to accommodate both human beings and their livestock with three levels. Humans stayed in the middle floor while animals were shuffled between the lowest and top floors depending on the weather conditions which sometimes brought floods. Fishing became the primary economy and canoe the sole means of transportation from door to door or village to village. The stilt houses of Ganvié. Image courtesy of Wikipedia. Click for source. Ganvié apparently means ‘safe at last’. The majority of refugees were Aja-speakers coming from a place referred to as Tado. Later migrations into Ganvié brought Yoruba, Nupe and Gun people. There is some debate as to how exactly these people reached Ganvié, according to some sources the Yoruba were brought to Ganvié as captives headed for the Americas and the Nupe were brought to the water town in the mid-19th century also as captives. Considering the reasons behind Ganvié’s establishment, that the town engaged in slave trading and raiding would be ironic. Countering this argument is the proposition that Ganvié’s male inhabitants regularly went on bride-kidnapping missions on the mainland because the town lacked women. Though it has been suggested that the all non-Aja in Ganvié were captives, it has also been proffered that once any newcomer arrived in Ganvié they were instantly regarded as free and forbidden from capture by anyone. Regardless of this piece of history, now, the people of Ganvié all consider themselves Tofinu. Even though, in the past, they comprised several distinct ethnic groups, some that were even at odds with each other. They emerged as one due to the difficulties in adjusting to the Lake in which they sought refuge and apprehension caused by constant threat of external aggression by the Dahomey. Elements of other ethnic groups remain in the indigenous religion as, Shango the Yoruba god of thunder is worshipped in Tofinu society. The Tofinu came to excel in naval warfare employing the use of weapons such as javelin launchers, swords, guns (both locally made and imported) and what has been referred to as ‘an ingenious kind of Molotov cocktail’. One can presume they used all these weapons while on canoes. Thus, they ensured their own safety from raiding Dahomean armies. Bourgoignie, Edouard G 1972, Les hommes de l’eau: Ethno-ecologie du Dahomey lacustre. Paris: Editions Universitaires. Eccentric Yoruba is a really not that strange regardless of what her alias may suggest. She spends her days writing and blogging at Curiosity Killed The Eccentric Yoruba and Dreamwidth.